Sleaford Striders held their annual presentation night at Sleaford Golf Club last week, an evening to celebrate the success of the club and many of its members. Club chairman Bill Rayner recapped a wonderful year which included winning The Best 10k in The East Midlands Award, followed by the Town Council prize as the Best Club in Sleaford. They were also finalists in health and well-being at The NK Community Champions Award, before topping the year by being named the Best Sports Club in Lincolnshire. The evening began with Clive Holden and Jo Leadbitter announcing various awards to the junior members of the club, as well as medals for every junior member for their own inspiring performances. The senior awards followed, with Emily Foran voted Female Athlete of the Year, while Dave Burton took home the Male Athlete of the Year honour. Probably the biggest cheer of the evening went to Stan Yates when he was presented with the Clubperson of the Year award for all of the work he does on behalf of the Striders, and for his inspiring support whenever it is possible for him to attend an event. 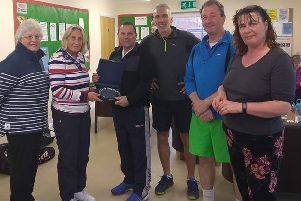 The Specsavers awards for the race series went to Dawn Bailey and Dave Burton, while Alison Robbins and Stephen Linden-Wyatt won the handicap series. Mark Page and Sue Patrick won the Endeavour Awards, and Maddie Banks won the Sportsmanship Award, with Clive Holden earning the Chairman’s Prize for his contribution to the club. A special recognition award was made to Steve Thacker to mark his completion of 100 marathons. Steve has now completed 104, having fittingly run another on the day of the presentations. Over the year members of Sleaford Striders log their runs online and this year they managed an incredible 35,000 miles. Those who achieved 500, 750 and 1,000-mile landmarks were presented with medals to mark their achievement. The Strider with the most miles in the 12 months was John Siddens who managed an amazing 2,000 miles. * Sleaford Striders is an inclusive club with junior members starting from the age of six, and no upper age limit for adults.